I think I have told you before about my little sister. And how I can't say "no" to her. Last November she asked me to run a half marathon with her. And since I don't tell her no, well, you get the picture. That "yes" only meant entering a lottery system. What where the odds our number would be picked and I'd actually have to do this thing? Remember this was right after my last-minute entry into the Happy Girls Half Marathon in Sisters. The last thing on my mind was training for another half marathon. In early December, we got the official word. And the text I got from another friend who had also entered went something like this: "The only words I can think of are four letter ones." The planning began in December. And the training. 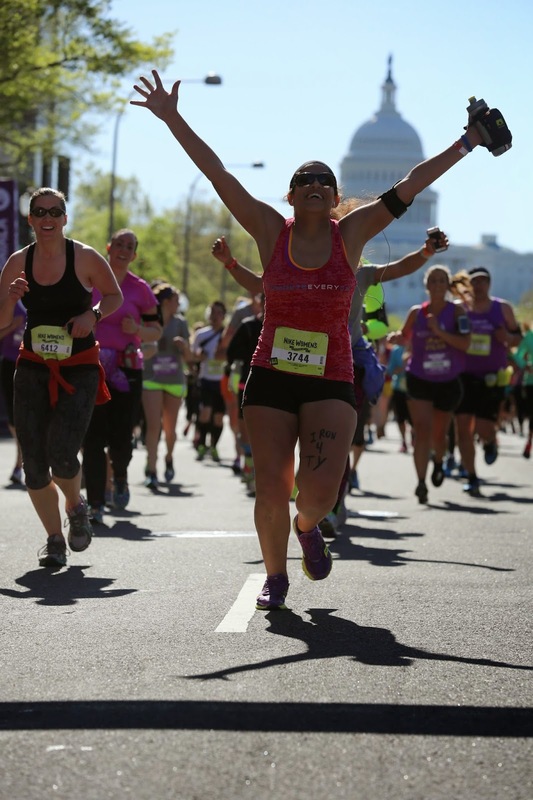 And this girl, she was so excited to be running in the Nike Women's Half Marathon in Washington, DC. I flew a red-eye and arrived early Friday morning. After a short nap and a shower, we headed down to the expo in Georgetown. And of course, we all had to have our photos made with this giant wall of the names of over 15,000 runners. This girl convinced us to stand in line for cupcakes. None of which I could eat (but that's a story for another day). We then took her out to Old Town Alexandria. In all her visits out there, she'd never been. I make a point to go near about every time I'm in the area. I got to catch up with two of the best. And can you believe all that happened on Friday? Saturday we woke early to meet my uncle on his first ever visit to the Vietnam Veteran's Memorial Wall. I've written before about the Yellow Hatters, and Charlie planned his trip town from Boston to be there at the same time we were. But we didn't know until a couple weeks beforehand that our uncle would be making his first trip that same weekend. It was great to be there with him and catch up. We clearly do not believe in sleeping in or resting while on vacation, because Sunday was race day and we woke before the sun. In the end it was all worth it. The crazy whirlwind weekend. The training. The loss of sleep. We ran 13.1 miles. With some of the best views and music accompanying us. Some of my favorite parts of the race included running past George Mason's Green Machine pep band, one of many groups stationed throughout the course. And especially crossing Memorial Bridge over toward Arlington Cemetery and back, and remembering a similar journey I took over that bridge during the Rolling Thunder parade in 2006. I have a suspicion that my sister's main motivation for running this race is that Nike teams up with Tiffany & Co. to make and design the finisher's medals/necklaces. 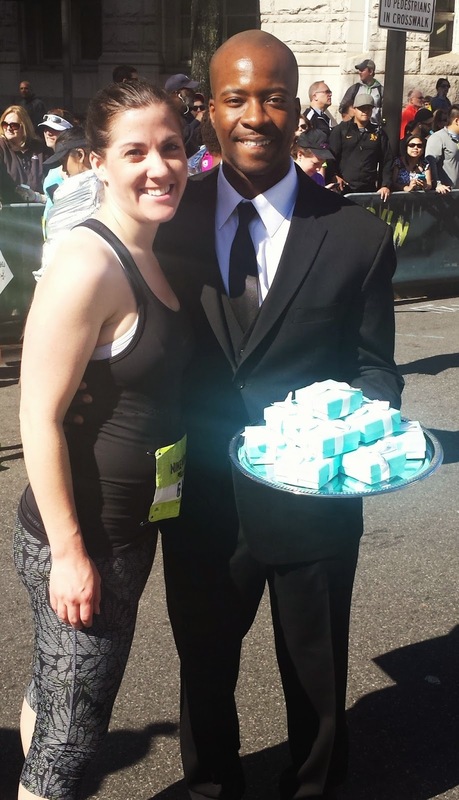 I tried to tell her that it'd be cheaper to buy the necklace than to run the race, but she didn't listen to me. Maybe her motivation was seeing all the ROTC fellas dressed in tuxes handing out those little blue boxes. And I suppose I can't blame her. My understanding is that this was only the 2nd year Nike has held the SF counterpart race in DC. I can only imagine the hills in SF. Three of us flew out from Oregon and one drove up from Texas, and a few others live in the DC area. I absolutely encourage convincing your friends to run with you.